An 8-day safari with more than a hint of adventure - from the rugged and beautiful wilds of Meru, to the rolling plains of Loisaba and its offering of exciting safari activities, to the spectacle of nature’s greatest theatre - the Masai Mara. Pack your bags for an adventure of a lifetime with unhindered views of Nature and its beautiful creatures - from rhinos and elephants, to lions, leopards and cheetahs! Why not extend your trip to Kilindi Zanzibar for 6 days relax on this Exotic Spice Island? Not ready to leave yet? Why not spend an extra 3 days in Serengeti National Park for more Game Drives? Stay longer to explore the immense Masai Mara Reserve for 3 days. Welcome to Kenya! You will be met at Jomo Kenyatta International Airport and welcomed by your Elewana Representative and transferred to your hotel in Nairobi. You will be transferred to Wilson Airport Nairobi - the gateway to the flying safaris in Kenya. Your Sky Safari will now take to the Air! The plane will take you to Meru National Park located in the Mount Kenya Region, where you will then transfer to your next accommodation stay. Enjoy a massage for pure relaxation, or alternatively go on a Game Drive. Meru National Park is famous for large elephant herds, lion and bird life, and more diversity of animal species than any other park in East Africa. Activities include nature walks, fishing in the streams, Game Drives to Kora and Bisanadi National Reserves, and Sundowners served overlooking the park, before returning back to camp. The morning is spent at your leisure before boarding the Sky Safari aircraft for a 40 minute flight to Loisaba Conservancy, Laikipia. 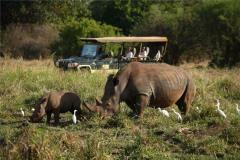 The team from the Camp will meet you for a Game Drive and after, transferring you to your next accommodation. Loisaba Conservancy is outstandingly beautiful and immense; an area size that is bigger than ten of the world's fully-fledged nations. You could take months exploring this land and never encounter the same view twice. Enjoy morning walking safaris by traditional Samburu guides whose knowledge of local flora, fauna, culture and history is unmatched. Set off on a Game Drive to search for the rare Grevy's Zebra, Beisa Oryx, or the Greater Kudu. You could also try your hand at fishing in the river or visit the resident anti-poaching team with its two sniffer dogs. Your morning will begin with an early Game Drive before transferring to the Loisaba Airstrip for your Sky Safari flight to Masai Mara. The Sand River Masai Mara team will pick you up for a Game Drive, transfer you to the Camp and then relax in the evening with Sundowner drinks and dinner. In the early morning, you will partake in one last Game Drive with the guides before transferring back to Keekorok Airstrip for your flight to Wilson Airport Nairobi. A representative will welcome you upon arrival and taken to Jomo Kenyatta International Airport for your outbound flight.